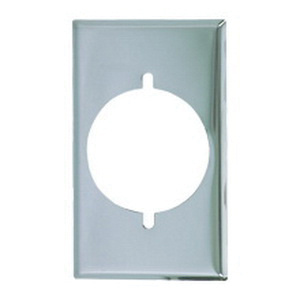 Cooper Wiring Device 1-Gang Standard rectangular power outlet wallplate in chrome finish, measures 2.75-Inch x 4.5-Inch. Screw mountable wallplate has one 2.15-Inch hole power outlet configuration. Wallplate is UL listed and RoHS/NAFTA compliant.